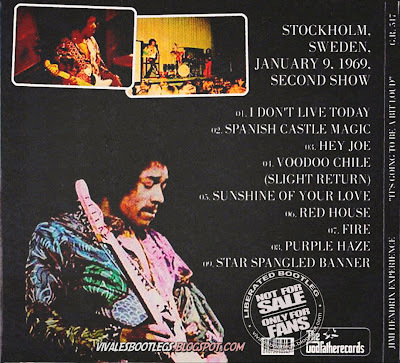 Recorded Live at Konserthuset , Stockholm , Sweden - January 9, 1969. Files: 9.:: Size: 398,97 MB (flac). 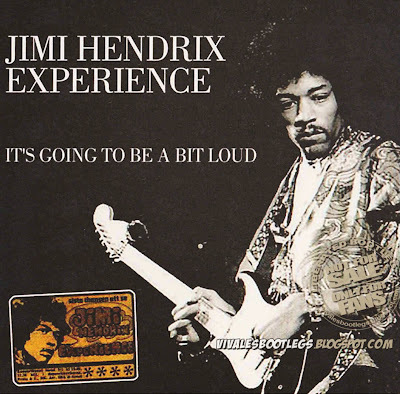 Personnel: Jimi Hendrix – lead vocals, guitar :: Mitch Mitchell – drums :: Noel Redding – bass guitar, guitar, backing vocals. Notes: This release from the Godfather features a rare show from Jimi Hendrix & the Experience. Released originally on Disk 2 of Swingin’ Pig’s “On The Killing Floor” it’s broadcast on Swedish radio ensures it’s status as one of the few Hendrix bootlegs worth its salt – the ambience is close to most of the BBC sessions that have been officially released & are in near pin drop quality although while the Beeb never usually had an audience then the audience are loud & clear here though they never distract from the entertainment. This is the second of two shows played that day – the first being recorded for SVT Swedish Television & available on DVD synced with sound if equal quality on “Live In Sweden” [ Which is also reviewed on this site ] While The following night to this show appears on Midnight Beat’s “Welcome To The Electric Circus” [ MB CD 016 ] the sound of the Midnight Beat CD is nowhere near comparable to this release. According to Hagar’s review of the above DVD then Jimi seems distracted tonight – hardly acknowledging his fellow band members or even the audience but while this may be true then his playing is never anything than exemplary & sounds like Jimi at his peek. (taken from collectros music reviews).